Sarah Kilbreath is a junior majoring in communication studies with a minor in art history and a concentration in the Gerald R. Ford Institute for Leadership in Public Policy and Service. She is a resident of Owosso, Mich., and a graduate of Owosso High School. For Sarah Kilbreath, '20, an on-the-job problem ended up giving her an informal evaluation of her internship success. "I was riding crew with two guys and we were going to spend the day shooting interviews at a cancer research conference," she recalls. "I wasn't the original intern on the crew and event security didn't want to let me in because my name wasn't on the list. We called my internship supervisor and he said I should just go home." Her crew had other ideas. "They found the conference director and fixed it," Kilbreath says. "They came to my defense, because I was there to work and they knew I could do it." In deciding to attend Albion College, Kilbreath assumed she would give up her dream of working in media production. But thanks to The Philadelphia Center, Kilbreath spent the fall semester on shoot sets, in editing rooms, and drinking a lot of 5 a.m. coffee, getting valuable experience in a field she hopes will become a career. 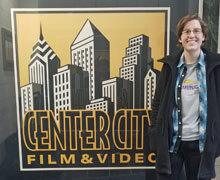 "It was a veritable leap of faith since I was coming into it with no prior knowledge, but those jumps are a necessity for going to The Philadelphia Center," says Kilbreath, who interned with Center City Film and Video. Besides working with onsite film crews, Kilbreath shadowed video editors and worked with CCFV's sister company, which provided special-event virtual-reality instruction for 100 medical students at a time (Kilbreath assisted with setup and teardown). The days were long. "Sometimes crew call was 6:30 a.m., and being on time meant you were late," Kilbreath explains. Still, she notes that some of the best experiences happened on 10- or even 13-hour days, as Kilbreath received hands-on instruction in setting up and running lighting, sound and film equipment. On one commercial shoot she was put in charge of the teleprompter, "which filled me with an absurd amount of adrenaline," she recalls. The pressure, however, was just what Kilbreath wanted. "It happened a lot when doing most things for the first time, but the goal was to move from being explicitly told what to do and how to do something to predicting and doing it before being asked," she says. "It wasn’t about being the 'good little intern,' it was about learning and becoming a part of the crew. "At the end of one shoot, the guys on the crew said it was the hardest shoot they'd ever been on," Kilbreath concludes. "I thought, 'There's got to be worse days than this.' Learning what I can actually handle, what my aptitude curve is—I can't wait to do this again."